I know I have a lot of back-log, but it’s only recently that I’ve decided to be more invested in what I do for this website. So despite this happening 2 years ago, I want to share our experience because I know it can help a lot of families figure out places they can opt to go around the Philippines. Around two summers ago, Bobby & I planned a four-day roadtrip to Bicol - the region known to be the home of the ocean gentle giants butandings, the majestic Mayon Volcano, and beautiful natural features like mountains, waterfalls with lush vegetation, and beaches. We made it a personal goal to hit three provinces during this trip because we love the thrill we get being on the road, traveling without a set itinerary, and well, ticking off stuff in our family travel bucketlist. One of the places most things or people pointed to was visiting Lake Buhi in Camarines Sur - and well, after some research, we found a family-run place to stay for the night before we headed to Albay! 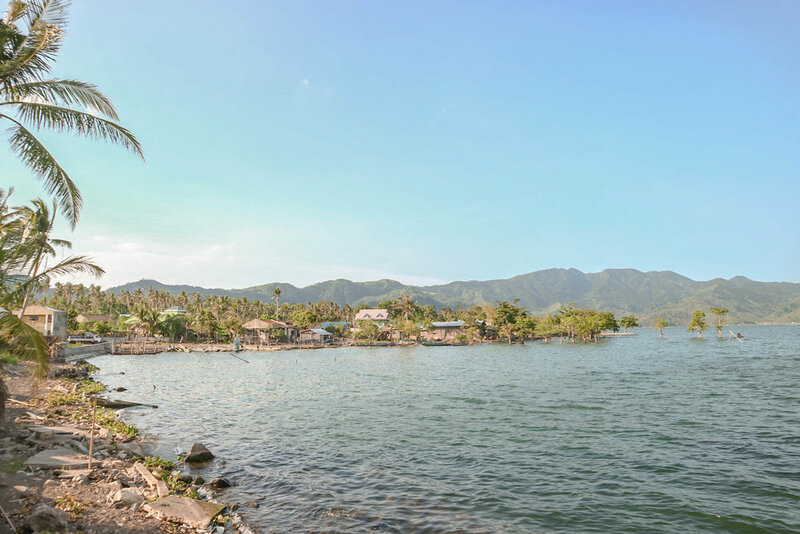 In 1994, he built Lake Buhi Resort as his way of giving back to the town, and to assist the local community by giving them an avenue to work, and, of course, to bring pride to the place of his roots. It was a cozy place. We had the resort all to ourselves when checked-in! We stayed in a very spacious room. It’s pretty basic: two queen-sized beds, a big area for Yñigo to run around, and a working bathroom. No TVs whatsoever, so you better ready yourself if you’re not used to that. It can be really quiet at night, and of course, their staff have families to go home to, so if you need anything, better to say it before they go… or you can try talking to the caretaker who stays in 24/7. They have a kitchen where you can have food prepared, but you have to let them know in advance if you’re lunch-ing or dinner-ing at Lake Buhi Resort or not. The resort is pretty isolated from the town proper. There are stalls and sari-sari stores around, but best to bring food also if you need to! Just make sure to call them to ask if there’s corkage. We mostly brought snacks since Yñigo was just shy from 2 years old - which meant him only eating things that he loves or he’s familiar with. The staff was very accommodating - making sure we were well taken care of! If only I could remember the name of the Kuya who helped us throughout. What we appreciated most was that we were beside Lake Buhi. Like literally along its shores. And if you’re lucky enough, you’ll see the Mayon Volcano from a distance - it’s distinct, perfect cone peering through the mountains surrounding it. There’s a pool overlooking the mountains and the lake, which is really picturesque. The water can be cold, especially if the sun isn’t out. There are also places around the property where you can just chill, watch your kids run around, and take a moment of mindfulness. Tbh, bitin! We had to leave the next day, but we are truly grateful for the magic nestled in that place. Lake Buhi was beautiful. Even heard mga kwentong bayan on the mystical side of Lake Buhi. They said before, a town refused to help a man in rags (who apparently was a sort of sorcerer). After few days, the sky became very dark and a torrential rain poured on the town. It went on for hours, and before you knew it, the town disappeared after the mists cleared. In its place was the body of water now known as Buhi Lake. Some say that on clear days and nights, the people living by the lake could be see beneath the depth of the water - where the water people are engaged in merry-making, household chores, or even loom-weaving! Woah right? I mean, you’d be curious if you stared long enough in the water. Overall, we loved the experience. Again, don’t expect it to be as luxurious. We’re pretty simple people, and we’re happy with whatever we get. It’s a big house beside a vast lake, with mountains in the background - oh diba? Okay na! We appreciated the silence that took over at night, the space that Yñigo was free to roam at. We love the plants and critters we saw (lots of frogs at night haha). We would find ourselves staring at the lake - appreciating its beauty and grace. We waived at fishermen boating around, doing their routine, supporting their livelihood. We will go back when time permits. We can’t wait to see if the place changed… but more than that, we can’t wait to be in the presence of this mystic lake.